Probably dating from the 1870s, this set of four wine glasses (each about 4 1/4 tall), is almost certainly Boston and Sandwich. The glass has the true flint glass ring; the shape is well documented in the Barlow and Kaiser books, with just this six-sided cut and polished stem, and the Greek Border cutting is also documented there. So: shape, cut stem, and cut decoration all match Boston and Sandwich, and the attribution seems reliable. Very difficult to find in a single piece, and much more difficult to find in a set like this. There is some slight variation in size, as expected for hand-blown items, but all are the same height and must be intended as wine glasses. 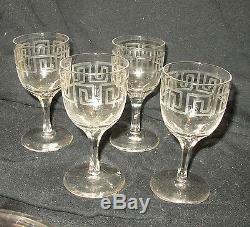 The item "Super set of 4 Boston and Sandwich Greek Key Border wine glasses, cut stems" is in sale since Friday, January 16, 2015. 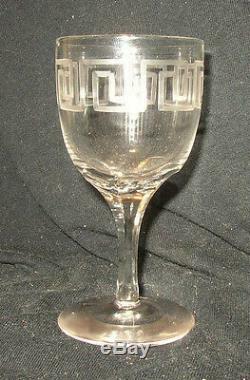 This item is in the category "Pottery & Glass\Glass\Glassware\EAPG Pattern Glass 1850-1910\Flint". The seller is "drrosie" and is located in Morgantown, West Virginia. This item can be shipped to United States, Canada, United Kingdom, Denmark, Romania, Slovakia, Bulgaria, Czech republic, Finland, Hungary, Latvia, Lithuania, Malta, Estonia, Australia, Greece, Portugal, Cyprus, Slovenia, Japan, China, Sweden, South Korea, Indonesia, Taiwan, South africa, Thailand, Belgium, France, Hong Kong, Ireland, Netherlands, Poland, Spain, Italy, Germany, Austria, Israel, Mexico, New Zealand, Philippines, Singapore, Switzerland, Norway, Saudi arabia, Ukraine, United arab emirates, Qatar, Kuwait, Bahrain, Croatia, Malaysia, Brazil, Chile, Colombia, Costa rica, Dominican republic, Panama, Trinidad and tobago, Guatemala, El salvador, Honduras, Jamaica, Bahamas, Viet nam.